Home Writing	From Whom to Get Advice? From Whom to Get Advice? 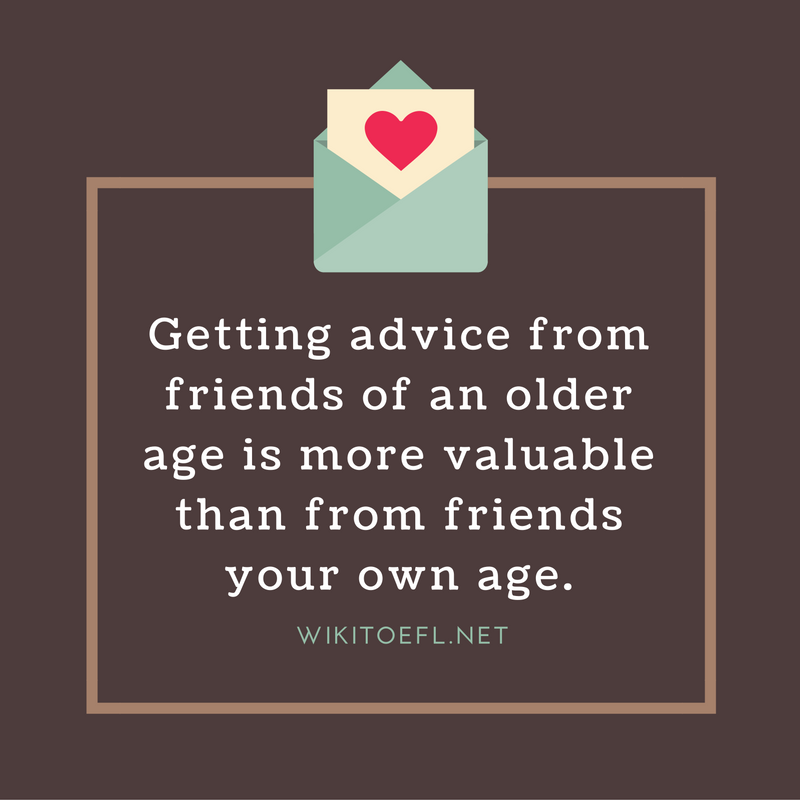 Getting advice from friends of an older age is more valuable than from friends your own age. It is generally believed that advice from older people would be more helpful than that from peers. I disagree with this belief. It is much better to get advice from people your own age than from people older than you. Your peers understand your problems much better than your elders. Older people often cannot relate since their current situations are much different from yours. This means their advice will not always work. However, people the same age comprehend your situation much better. They know which advice will work and which will not. A month ago, I had a problem at school. I asked my sister, who is five years older than me, for some advice. The advice she gave me was based upon what she would have done. It was good advice in general, but it was worthless for me. Fortunately, my classmate knew exactly what I should do and let me know. His advice enabled me to solve the problem. People feel more comfortable talking to their peers about problems than people different ages. When I have a problem, I am more open discussing it with my friends the same age as me. I feel differently with my parents. The other day, I had a problem too embarrassing to tell my parents about. Obviously, they could not advise me on it. However, I knew my best friend would understand me. So I explained my problem to him, and he gave me some great advice. Because I could say exactly what was bothering me, he could assist me. Getting advice from friends the same age as you is better than being advised by your older friends. Friends the same age understand your problems better, and they are easier to talk to than are older friends. For almost all of my problems, I consult someone the same age as me. Newspapers or TV as a News Sources?